Mercury-in-glass thermometer for measurement of room temperature. Daniel Fahrenheit's mercury-in-glass thermometer was far more reliable and accurate than any that had existed before, and the mercury thermometers in use today are made in the way Fahrenheit devised. Danzig-born Daniel Gabriel Fahrenheit, a pioneer of exact thermometry (or precision thermometry. He invented the mercury thermometer (first practical, accurate thermometer) and Fahrenheit scale (first standardized temperature scale to be widely used). 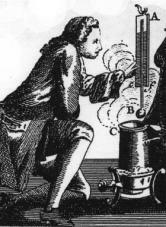 The mercury-in-glass or mercury thermometer was invented by physicist Daniel Gabriel Fahrenheit in Amsterdam (1714). It consists of a bulb containing mercury attached to a glass tube of narrow diameter; the volume of mercury in the tube is much less than the volume in the bulb. The volume of mercury changes slightly with temperature; the small change in volume drives the narrow mercury column a relatively long way up the tube. The space above the mercury may be filled with nitrogen gas or it may be at less than atmospheric pressure, a partial vacuum. In order to calibrate the thermometer, the bulb is made to reach thermal equilibrium with a temperature standard such as an ice/water mixture, and then with another standard such as water/vapour, and the tube is divided into regular intervals between the fixed points. In principle, thermometers made of different material (e.g., coloured alcohol thermometers) might be expected to give different intermediate readings due to different expansion properties; in practice the substances used are chosen to have reasonably linear expansion characteristics as a function of true thermodynamic temperature, and so give similar results. A large mercury in glass thermometer. The thermometer was used by the originators of the Fahrenheit and Celsius scales. Anders Celsius, a Swedish scientist, devised the Celsius scale, which was described in his publication The origin of the Celsius temperature scale in 1742. Celsius used two fixed points in his scale: the temperature of melting ice and the temperature of boiling water. This wasn't a new idea, since Isaac Newton was already working on something similar. The distinction of Celsius was to use the condition of melting and not that of freezing. The experiments for reaching a good calibration of his thermometer lasted for 2 winters. By performing the same experiment over and over again, he discovered that ice always melted at the same calibration mark on the thermometer. He found a similar fixed point in the calibration of boiling water to water vapour (when this is done to high precision, a variation will be seen with atmospheric pressure; Celsius noted this). At the moment that he removed the thermometer from the vapour, the mercury level climbed slightly. This was related to the rapid cooling (and contraction) of the glass. When Celsius decided to use his own temperature scale, he originally defined his scale "upside-down", i.e. he chose to set the boiling point of pure water at 0 °C (212 °F) and the freezing point at -100 °C (-32 °F). One year later, Frenchman Jean-Pierre Christin proposed to invert the scale with the freezing point at 0 °C (32 °F) and the boiling point at 100 °C (212 °F). He named it Centigrade (100 grades). Place the cylinder of the thermometer in melting ice made of pure water and mark the point where the fluid in the thermometer stabilises. This point is the freeze/thaw point of water. In the same manner mark the point where the fluid stabilises when the thermometer is placed in boiling water vapour. Divide the length between the two marks into 100 equal parts. These points are adequate for approximate calibration but both vary with atmospheric pressure. Nowadays, the triple point of water is used instead of the freezing point (the triple point occurs at 273.16 kelvins (K), 0.01 °C). Before the discovery of the true thermodynamic temperature, the thermometer defined the temperature; thermometers made with different materials would define different temperature scales (a coloured alcohol thermometer would give a slightly different reading than a mercury thermometer at, say half-scale). In practice, several materials gave very similar temperatures to each other and, when discovered, to the thermodynamic temperature. Closeup of a maximum thermometer. The break in the column of mercury is visible. A medical mercury-in-glass maximum thermometer showing the temperature of 38.7 °C. One special kind of mercury-in-glass thermometer, called a maximum thermometer, works by having a constriction in the neck close to the bulb. As the temperature rises, the mercury is pushed up through the constriction by the force of expansion. When the temperature falls, the column of mercury breaks at the constriction and cannot return to the bulb, thus remaining stationary in the tube. The observer can then read the maximum temperature over the set period of time. To reset the thermometer it must be swung sharply. This design is used in the traditional type of medical thermometer. A maximum minimum thermometer, also known as Six's thermometer, is a thermometer which registers the maximum and minimum temperatures reached over a period of time, typically 24 hours. The original design contains mercury, but solely as a way to indicate the position of a column of alcohol whose expansion indicates the temperature; it is not a thermometer operated by the expansion of mercury; mercury-free versions are available. Mercury thermometers cover a wide temperature range from −37 to 356 °C (−35 to 673 °F); the instrument's upper temperature range may be extended though the introduction of an inert gas such as nitrogen. This introduction of an inert gas increases the pressure on the liquid mercury and therefore its boiling point is increased, this in combination with replacing the Pyrex glass with fused quartz allows the upper temperature range to be extended to 800 °C (1,470 °F). Mercury cannot be used below the temperature at which it becomes solid, −38.83 °C (−37.89 °F). If the thermometer contains nitrogen, the gas may flow down into the column when the mercury solidifies and be trapped there when the temperature rises, making the thermometer unusable until returned to the factory for reconditioning. To avoid this, some weather services require that all mercury-in-glass thermometers be brought indoors when the temperature falls to −37 °C (−35 °F). To measure lower meteorological temperatures, a thermometer containing a mercury-thallium alloy which does not solidify until the temperature drops to −61.1 °C (−78.0 °F) may be used. As of 2012[update], many mercury-in-glass thermometers are used in meteorology; however, they are becoming increasingly rare for other uses, as many countries banned them for medical use due to the toxicity of mercury. Some manufacturers use galinstan, a liquid alloy of gallium, indium, and tin, as a replacement for mercury. The typical "fever thermometer" contains between 0.5 and 0.3 g (0.28 and 0.17 drachms) of elemental mercury. Swallowing this amount of mercury would, it is said, pose little danger but the inhaling of the vapour could lead to health problems. Map of the countries of the European Union that banned mercury-in-glass thermometers according to Directive 2007/51/EC as of 22 January 2013. Countries in blue have made legal bans on the issue, countries in gray are of unknown status at the present, and countries in red are those whose "Member State does not consider national execution measures necessary." In February 2009, the Argentine Health Ministry instructed by resolution 139/09 that all health centres and hospitals should buy mercury-free thermometers and blood pressure meters and called on dentists, medical technicians, and environmental health specialists to start eliminating this toxin. As of 2016[update] mercury thermometers were still on sale to the public at pharmacies. There was a voluntary take-back action for thermometers containing mercury based on the Federal Waste Management Plan 2006, and carried out in close cooperation between the Austrian Chamber of Pharmacists (Österreichische Apothekerkammer), the Federal Ministry of Environment, a private waste disposer, a producer of electronic thermometers and a pharmaceutical distributor. The disposal company supplied each pharmacy (approximately 1,200) with a collection bin and covered the cost of disposal. The pharmaceutical distributor covered the logistical costs for the distribution of the thermometers. The pharmacies accepted a refund of only 0.50 Euro per thermometer for handling (which is far below their normal margin). The supplier provided the thermometers at a reduced price. The Federal Ministry supported each sold thermometer (covering about 30% of the direct costs) and advertised the project. During the collection period, consumers could bring in a mercury thermometer and buy an electronic thermometer for a subsidised price of 1 Euro. Between October 2007 and January 2008, about 465,000 electronic thermometers were sold and about one million mercury thermometers (together containing about 1 tonne of mercury) were collected. By the Philippines Department of Health’s Administrative Order 2008-0221, all mercury equipment from hospitals, including mercury-in-glass thermometers, will be phased out in the Philippines by September 28, 2010. Even before the order was released, 50 hospitals have already banned mercury from their establishments. Among these fifty hospitals, the Philippine Heart Center was the first one to do so. San Juan de Dios Hospital, Philippine Children’s Medical Center, San Lazaro Hospital, Ospital ng Muntinlupa, Lung Center of the Philippines, the National Kidney and Transplant Institute, Manila Adventist Medical Center and Las Piñas Hospital also made steps to ban the toxic chemical. The country was the first one to make a step to ban mercury from its health care system in Southeast Asia. Since European Union directive 2007/51/EC came into force on 3 April 2009, the UK Health Protection Agency (HPA) reported that mercury thermometers could no longer be sold to the general public. Shops holding stocks of unsold thermometers had to withdraw them from sale; mercury thermometers purchased before this date could be used without legal implications. The purpose of these restrictions is to protect the environment and public health by decreasing the amount of mercury waste released. The HPA had, in 2007, released a guide to dealing with small spills of mercury. ^ "Anders Celsius 1701–1744". Astronomical Observatory: History. Uppsala University. ^ "Thermometers and Thermostats: Fever Thermometers". Mercury and the Environment: Products that Contain Mercury. Environment Canada. 2010-06-03. * basal temperature thermometers, containing about 2.25 grams of mercury. ^ "Mercury and Human Health". Healthy Living: It's Your Health: Environment. Health Canada. 2009-03-02. Archived from the original on 2006-12-19. ^ "National Provisions communicated by the Member States concerning: Directive 2007/51/EC of the European Parliament and of the Council of 25 September 2007 amending Council Directive 76/769/EEC relating to restrictions on the marketing of certain measuring devices containing mercury". EUR-Lex. 72007L0051. ^ Salazar T (2008-09-13). "RP hospitals to phase out devices containing mercury". Philippine Daily Inquirer. Archived from the original on 2008-10-24. ^ a b Goldman LR; Shannon MW; Committee on Environmental Health (July 2001). "Technical report: mercury in the environment: implications for pediatricians". Pediatrics. 108 (1): 197–205. doi:10.1542/peds.108.1.197. PMID 11433078. ^ "Things are Heating Up with Mercury in Thermometers". Children's Health Protection. US Environmental Protection Agency. "Mercury in your Environment is great". US Environmental Protection Agency.